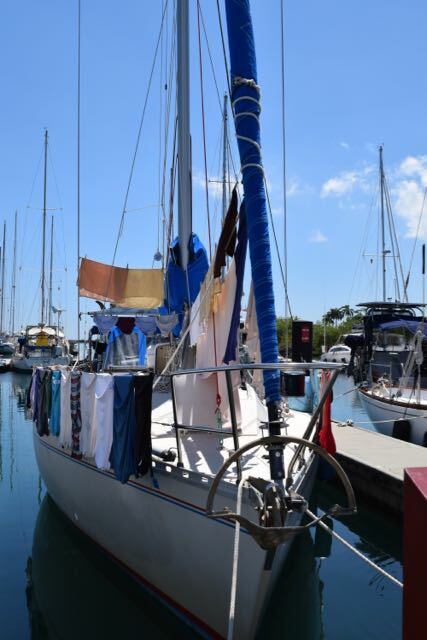 Laundry day at the marina. Pay for the washer, then hope it doesn’t rain. When we left Wisconsin, we estimated that we’d be paying around $2000 to go through the Canal. We don’t think it’s going to work out that way, in fact. We’ll write in detail about the nuts and bolts of our transit after we’re safely through, but for the moment, we plan to transit without an agent. That means we’re not spending between $350-$600 to have a local help us through the process. Consequently, we’re spending a bit more time paying fees, filling out forms, and making trips to Colon; for us, that’s meant more time at Shelter Bay Marina, and additional communications dollars to stay connected by phone and web. Still. We hope to spend much less than we originally anticipated; and unlike an agent, the marina has a pool. Where would you rather put your money? We’re stocking up. That may not be super-apparent, but it will be next month, for sure. Costa Rica is supposed to be wildly expensive compared to Panama. We’re upping the groceries, little by little, and laying in a good supply of stove fuel. Despite all of our trips to Colon for groceries and fun meetings with the Canal Authority, we didn’t spend any money on transportation this month. Free marina shuttle for the win! The Canal fees listed above cover our measurement, our advisor, and services during transit. We still have to rent lines and fenders, and we may have some expenses pertaining to our line handlers. We’ve also paid a deposit of $891, not listed, which should be returned to our bank if everything goes smoothly. Here’s hoping. Wow you guys, I would not of had any idea it would be that much to do all this! I was still stuck on your last blog about living together on the boat….definitely some tough times and more good times to come….be safe, you sound very informed and I would definitely go for the pool choice! How was Colon ?. When we were there it was very rundown. A lot of poverty. We were told It was not very save to walk around in Colon. Is that still the case?. It’s not a place you’d want to hang out. We hear it’s safer than it was a decade ago, but most people would advise against strolling around. Primarily drug-related crime.